David González was born in Monterrey, NL, on April 20, 1954. Having started in painting at 7 years of age was from 13 painting portraits. Self-taught architect by profession, he began performing professionally since 1977 paintings and having his first exhibition in 1979 and there have emerged many more in Mexico, United States and Puerto Rico. In 1982 he founded and directed the group of painters called Sketch. That mobilizing easels, paints and paper, was installed in squares and public places, free portraying who wished. In October 1985, he founded and directed the Academy of Fine Arts located on Calle Padre Mier, in the center of Monterrey, which promotes exhibitions, workshops, art talks, conferences, hearings, etc. Specialization within his work is the portrait and the main feature is completely figurative. Techniques that handles within the painting are watercolor, pastel, oil, acrylic, mixed media, as well as in sculpture: Modeling clay, wood and stone carving, bronze figure, etc.. In his career he has performed countless paintings of characters from our society as mayors, governors and presidents, artists and original works like the familiar watercolor "The Blessing". 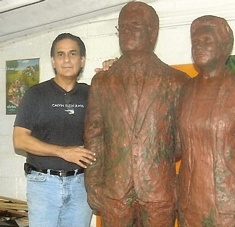 From 1977 to date he teaches in his own art studio located in San Pedro Garza Garcia, NL Mexico.